Thanks, Ronnie McGhee. A fossil on Mars..., another example that deserves attention, posted 28 Oct 2015. 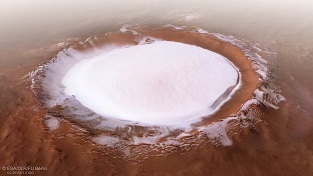 Korolev crater on Mars, 82 kilometers across, holds permanent ice almost 2 kilometers deep. Pictures of it were assembled from overlapping images scanned by ESA's Mars Express, now completing its fifteenth year in orbit. ...Winter Wonderland on Mars, ESA (+New Scientist), 20 Dec 2018. Thanks, Rob Cooper and Stan Franklin. Life on Mars! has more. New research points to panspermia. 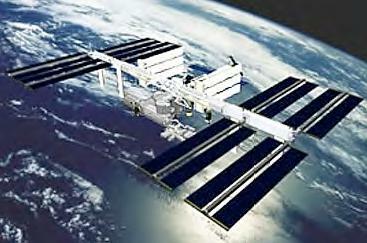 One study suggests that sugars similar to those in DNA are made abiotically, in the right circumstances, in space. They are among the complex organics found in meteorites, and contamination on earth (but not in space) is also mentioned as a possible source for them. If these organics ultimately fell onto a planet as ingredients for a pre-biotic soup, we call that pseudo-panspermia. Another study calculates that a considerable volume of Earth's surface has been blasted into space, and that some microbes in it would have survived to possibly seed comets, moons or other planets. Call that impact, meteoritic, or lithopanspermia. Deoxyribose and deoxysugar derivatives from photoprocessed astrophysical ice analogues and comparison to meteorites by Michel Nuevo, George Cooper and Scott A. Sandford, Nature Communications, 18 Dec 2018. Lithopanspermia - The Terrestrial Input During the Past 550 Million Years by Martin Beech, Ian M. Coulson and Mark Comte, doi:10.11648/j.ajaa.20180603.14, American Journal of Astronomy and Astrophysics, 27 Nov 2018. New research supports the idea that life can spread from one world to another by Dirk Schulze-Makuch, AirSpaceMag.com, 19 Dec 2018. Thanks, Cody Bennett, Stan Franklin and Google Alerts. Introduction has history. ...New Questions describes the varieties of panspermia. Horizontal Gene Transfer (HGT) is the only source for all of the evolutionary innovations observed among all of the bacterial clades examined. At Heinrich Heine University, Düsseldorf, two specialists in biology and computer science examined the genomes of 53 strains of E. Coli. Among the strains they identifed over three thousand metabolic innovations which they could correlate with specific genetic changes. Remarkably, the (diagrammed) analysis indicated that each genetic change arrived by the transfer of a single strand of DNA. Usually it held only one, but sometimes as many as five relevant genes. Furthermore, not one innovative gene had apparently been composed from scratch using host DNA, although genes must originate that way in the standard theory. If this result doesn't give neo-darwinists a reason to reconsider, nothing will. Each of 3,323 metabolic innovations in the evolution of E. coli arose through the horizontal transfer of a single DNA segment by Tin Yau Pang and Martin J. Lercher, doi:10.1073/pnas.1718997115, PNAS, online 18 Dec 2018. Testing Darwinism... and Ernst Mayr's comment about HGT are other related CA postings. 08 Mar 2019: Horizontal Operon Transfer (HOT) from bacteria to eukaryotes! A nuclear-powered 'tunnelbot' to search for life on Europa, University of Illinois (+Newswise), 14 Dec 2018. Life on Europa, Other Moons, Other Planets? has related links. 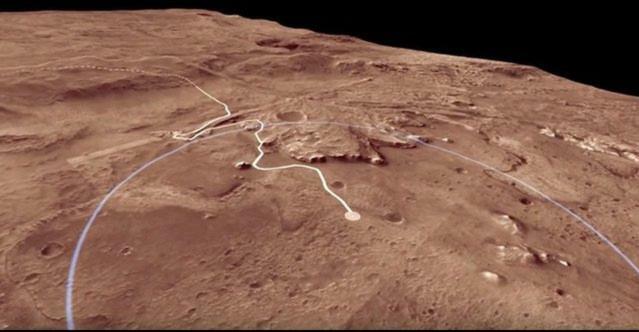 The Mars 2020 rover is aimed at Jezero Crater, a likely place to look for past life, NASA says. The crater once held a Tahoe-sized lake fed by a river. Now the river delta, sedimented bottom and shorelines, occasionally excavated by later impacts, are exposed. Mars 2020 Landing Site: Jezero Crater Flyover, a two-minute video on Space.com, posted 16 Dec 2018. This time, we hope, NASA will carefully look at the evidence. In 2004, a fossil that looks lifelike to us was photographed once, then quickly obliterated with that rover's Rock Abrasion Tool and shamefully ignored. Why?! A fossil on Mars resembles one on Earth, posted 28 Oct 2015. Life on Mars! describes lots of direct and indirect evidence gathered for more than 20 years. Weather on a Comet? A brief movie seems to show a blizzard in the shadow of a cliff on Comet 67P, aka Churyumov-Gerasimenko. In 2016, a telescopic camera on ESA's Rosetta spacecraft circling 20 kilometers away took the 33 frames over about 25 minutes. Collapsed into a fast sequence, they show ice and other particles drifting or streaking across the near field, with the cometscape turning and stars descending in the background. The movie makes it easy to visualize comets accreting and shedding material as they wander. 7.7MB one-second animated gif of comet 67P, frames taken 01 Jun 2016. Astronomy Picture of the Day has details, 26 Apr 2018. Thanks go to Jacint Roger Perez for carefully assembling the movie. Thanks, Nature, for alerting us. 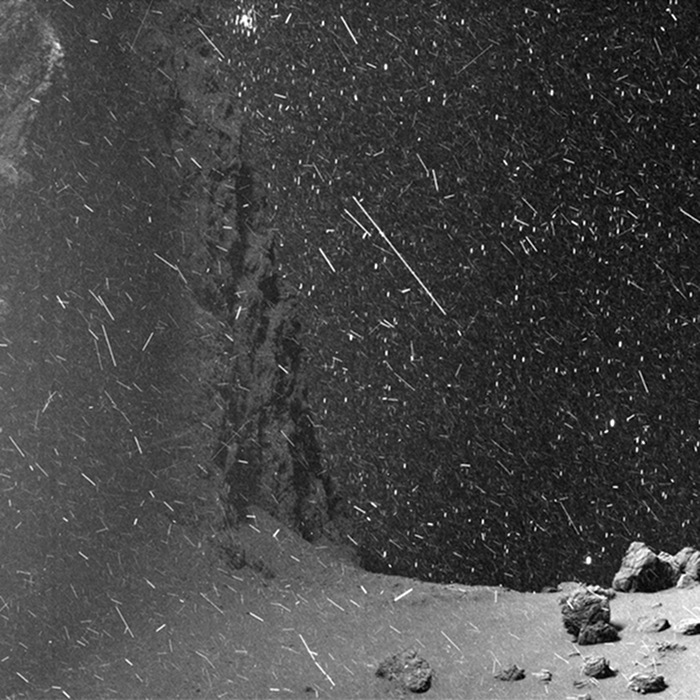 Comets Rendezvous has background and updates about Rosetta. Thanks, Martin Langford. Life on Mars! has more. Life in Deep Earth Totals 15 to 23 Billion Tonnes of Carbon..., the Deep Carbon Observatory, 10 Dec 2018. Global team of scientists find ecosystem below earth that is twice the size of world's oceans by Jonathan Watts, The Guardian, 10 Dec 2018. Thanks, George Nickas. Mature Extraterrestrial Biology in Astrophysical Phenomena: Edward J. Steele et al. reply to critical numerical analysis of R Duggleby on "Cause of Cambrian Explosion: Terrestrial or Cosmic?" (alternate), Progress in Biophysics and Molecular Biology, online 09 Nov 2018. 21 Mar 2018: links to the original article by Steele et al. Thanks to Daryl Wallis, Robert Temple and the Astrobiology Research Trust, the reply is now Open Access. We hypothesize that the interplay of NHEJ [nonhomologous end-joining] and retroelements may have played a previously unappreciated role in the evolution of advanced life. Ten physicists at the University of Illinois, Urbana-Champaign, say this after phylogenetic experiments in which retroelements, including human ones, were transferred into bacteria. Among their conclusions, proliferation of retroelements in eukaryotes and subsequent addition of complexity to the eukaryotic genome may have been enabled by precise tuning of parameters, leading to suppression of growth defects and enhancement of integration efficiency. Testing the retroelement invasion hypothesis for the emergence of the ancestral eukaryotic cell by Gloria Lee et al., doi:10.1073/pnas.1807709115, PNAS, 04 Dec 2018. These physicists are also darwinists, but unconventional ones, like coauthor Nigel Goldenfeld. Here they suggest a new path by which eukaryotes may have evolved from prokaryotes. We think their related observations – that the integration of retroelements contributes to eukaryotic complexity, and that introns may have a constructive role in evolution – also support an amendment to darwinism even more fundamental than they openly contemplate. Viruses... and Introns... are related CA webpages. Nigel Goldenfeld is the subject of a posting, 01 Sep 2017. For understanding evolution, we continue to advocate quarantined experiments that could demonstrate sustainable macroevolutionary progress. Success in the experiments, even in computer simulations, would supply needed proof for the darwinian paradigm; failure might allow consideration of new alternatives. Testing Darwinism... and The Evolution Prize introduce our advocacy of quarantined experiments. Multimicrobial Kombucha Culture Tolerates Mars-Like Conditions Simulated on Low-Earth Orbit by Olga Podolich et al., Astrobiology, online 28 Nov 2018. Bacteria... has more about the hardiness of prokaryotes. Remarkably, both [mite] genomes exhibited evidence of ancient lateral gene transfer from soil-derived bacteria or fungi. The transferred genes confer functions that are rare in animals.... The case for lateral or horizontal gene transfer (HGT) across all of life is again reinforced. 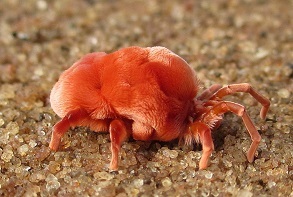 Mite genomes reveal 'mighty surprising' fragrant and colourful secrets, University of Liverpool (+PhysOrg.com), 19 Nov 2018; re: Genomes of trombidid mites reveal novel predicted allergens and laterally-transferred genes associated with secondary metabolism by Xiaofeng Dong et al., GigaScience, 15 Nov 2018. Viruses... has background and ~1,000 links related to HGT. The NASA Roadmap to Ocean Worlds by Amanda R. Hendrix et al., Astrobiology, online 13 Oct 2018. Life on Europa, Other Moons, Other Planets? has links about possible life on the same ocean worlds and more. Two astrobiologists consider the Drake equation's 4th term, the fraction of habitable planets which develop life. Among their observations is an understatement. On the Rate of Abiogenesis from a Bayesian Informatics Perspective by Jingjing Chen and David Kipping, Astrobiology, online 31 Oct (+arXiv.org, 21 Jun) 2018. The RNA World and The Second Law... have related discussion. Dynamical and Biological Panspermia Constraints Within Multiplanet Exosystems by Dimitri Veras et al., doi:10.1089/ast.2017.1786, Astrobiology, online 12 Sep 2018. Thanks, Google Alerts. 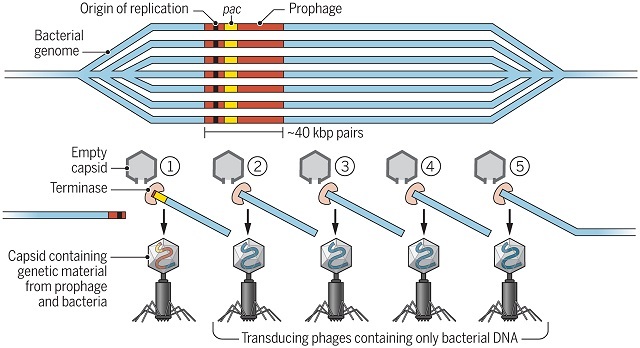 The lateral transfer of bacterial genes by viruses can be 1000-fold more effective than previously known, when mutliple transducing phages, carrying only bacterial DNA, are released to infect other cells. Genome hypermobility by lateral transduction by John Chen et al., doi:10.1126/science.aat5867, Science, 12 Oct 2018. A common trick for transferring bacterial DNA by Alan R. Davidson, Science, 12 Oct 2018. Viruses and Other Gene Transfer Mechanisms has background and many links related to HGT. 19 Oct 2003: Paul Turner of Yale tells us about gene transfer agents. Aren't these transducing phages also GTAs? Results from the Japanese mission Tanpopo "support the panspermia hypothesis." Survival Data of Deinococcus aetherius from ...the International Space Station... by Akihiko Yamagishi et al., Astrobiology, online 05 Oct 2018. Can The Theory Be Tested? has related links, including 11 Mar 2010: about Tanpopo. Life could potentially be exchanged over thousands of light-years. Cometlike objects could be spreading life ...throughout the Milky Way by George Musser, Science, 15 Oct 2018. Implications of Captured Interstellar Objects for Panspermia and Extraterrestrial Life by Manasvi Lingam and Abraham Loeb, The Astronomical Journal, 12 Oct 2018. Thanks, Sascha Wageringel. ...we show that panspermia is not exclusively relegated to solar-system sized scales, and the entire Milky Way could potentially be exchanging biotic components across vast distances. Harvard astrophysicists observe that objects like comets, asteroids or even planets can be spun away from the galactic center at velocities sufficient to reach the intergalactic medium. Considering the likely distribution of numerous variables in a fashion reminding us of the Drake equation, they firmly conclude, panspermia is viable on galactic scales. v 868, The Astrophysical Journal Letters, 19 Nov 2018. The Milky Way Could Be Spreading Life From Star to Star by Matt Williams, Universe Today, 12 Oct 2018. 09 Feb 2018: a related notice from Lingam and Loeb. Also see 01 Nov 2017: about an interstellar traveler. Introduction... has background. Comets... is related. Thanks, twice, Google Alerts. Elegant and precise genetic programs guide the forces that allow seemingly identical starting cells to develop into highly specialized entities.... In a special issue of Science, this comment comes in the introduction to eight articles about newly observed systems for controlling metazoan development. These systems utilize, for example, chromatin plasticity (illustration from Yadav et al. ), dynamic DNA methylation, developmental enhancers guided by chromosome topology, and "sequence-dependent stochastic switching at regulatory loci". Standard darwinism, by its logic, must eventually account for the origins of these systems, but no such accounts are yet even suggested. (To our surprise, a browser search for the case-insensitive string darwin found no matches in any of the nine related articles.) Meanwhile, elegant and precise genetic programs controlling development would further exemplify the robust software management that genomes require in cosmic ancestry. Forces behind form by Beverly A. Purnell, Steve Mao and Laura M. Zahn, Science, 28 Sep 2018. Robust Software Management in Genomes: this page is incomplete and under construction. Another project to explain the origin of life is announced. We will watch for any breakthroughs. Ground-breaking lab poised to unlock the mystery of the origins of life on Earth and beyond, McMaster University (+Newswise), 04 Oct 2018. The RNA World and Other Origin-of-Life Theories has background and links. Cyanobacteria thrive in the deep continental subsurface without light or oxygen. They could probably do as well in similar places on other planets or moons. So say sixteen astro- and molecular biologists after finding cyanobacteria-dominated communities in southwestern Spain, deep in rock formations analogous to ones on Mars. ...their unequivocal presence in samples from this and other studies ...increases their relevance in early life and astrobiological scenarios. Viable cyanobacteria in the deep continental subsurface by F. Puente-Sánchez et al., doi:10.1073/pnas.1808176115, PNAS, online 01 Oct 2018. The chart illustrates the metbolic pathways deployed by cyanobacteria from two samples. Oxygen-dependent and photosynthetic paths are crossed out, to indicate that they are useless. Surprise Life Found Thriving 2,000 Feet Underground by Maya Wei-Haas, National Geographic, 01 Oct 2018. Bacteria: The Space Colonists has lots more about their survival capabilities. Life on Mars! has additional evidence. Thanks, Robert Sweeney, Martin Langford, and Richard Hoover, who emails, ...These are the same genera of Cyanobacteria that Alexei [Rozanov] and I have often found embedded in freshly fractured interior surfaces of the Orgueil CI1 and Murchison CM2 Carbonaceous meteorites. See, for example Fossilized bacteria..., posted 03 Mar 2011. Meanwhile, a concurrent survey reports evidence of "the deep biosphere" from ten locations around the world. Life Thrives Within the Earth's Crust by Catherine Offord, The Scientist, 01 Oct 2018. How Some Algae May Survive Climate Change, Rutgers Today (+Newswise), 27 Sep 2018. 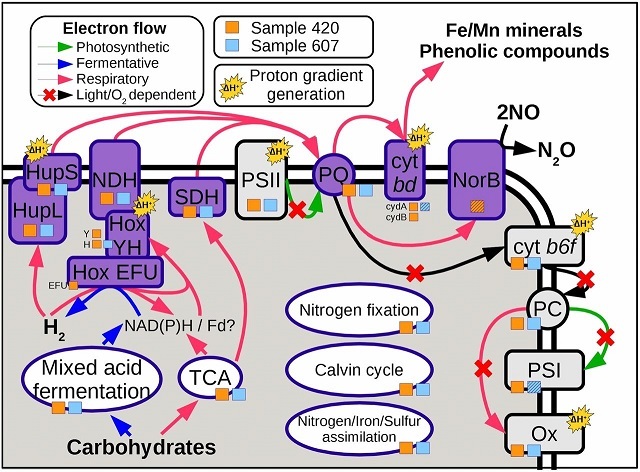 Genomic Analysis of Picochlorum Species Reveals How Microalgae May Adapt to Variable Environments by Fatima Foflonker et al., Molecular Biology and Evolution, 01 Sep 2018. Viruses and Other Gene Transfer Mechanisms has background with many recent & older links related to HGT.